My journey through Austria – at least the eastern edge of this landlocked country – was a brilliant demonstration of how pivotal Austria was to Europe and the near east. Visiting the charming family estate of Zuschmann-Schöffmann in the north brought me within 35 kilometres of the border with the Czech Republic, whilst we stood with Georg Prieler of his eponymous estate in Burgenland looking over nearby hills in Slovakia, then after dinner in a Heuriger near the Grozser Wien estate, a road sign informed me it was just one kilometre to the Hungarian border. Today Austria is a proud and impressive country of just eight million inhabitants, of whom almost one quarter live in the magnificent capital city of Vienna. But the sheer scale of the boulevards and public buildings confirms the power that once lay here, when the Austro-Hungarian empire laid claim to vast territories of central Europe. The Hapsburg’s and Esterházy’s no longer rule, and once outside Vienna’s suburbs the tranquil, pastoral countryside shakes of the busy confidence of the city to reveal a thoughtful, gentle people who seem very much in touch with agriculture, nature and the seasons. Vinegrowing in Austria is everywhere in the eastern half of the country, far from the alpine heights of the west. But traditionally viticulture has been on a very small scale, with grapes grown and modest wines made by farmers for whom wine was just one – and often not a very significant one – of several crops they grew or animals they reared. Basic family winemaking dominated the Austrian wine scene, and still does today, though there are far more estates focused purely on wine and making products of hugely better quality. 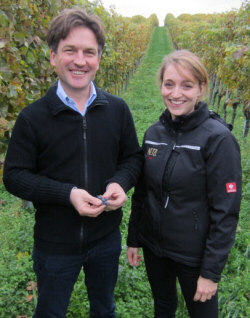 The great Valleys of Wachau and Kamptal to the west of Vienna have risen to prominence thanks to top producers like F.X. Pichler and Emmerich Knoll, but my visit would cover hundreds of kilometres east, north and south of Vienna to visit some of the younger generation of winemakers that are stamping quality on Weinviertel, Carnuntum, Burgenland and Styria. Whilst tasting broadly, I would focus on the indigenous grape varieties in each region that are now intrinsic for winemakers intent on expressing the best of their distinct terroirs. Austria just couldn’t be more continental. Slap bang in the middle of Europe, it enjoys a classic continental climate of hot summers, cold winters, good diurnal shifts (day to night temperatures) and generally moderate but sufficient rainfall. The significant influencing factors on localised winegrowing conditions are the mountains, the altitude of vineyards, and the rivers and lakes. Great lakes like the Neusiedlersee have a huge influence on vineyards planted near them, altering humidity and temperature, and creating conditions for Botrytis. Through the centre of the country, the great Pannonian plain to the east provides warming conditions, suitable for the production of red wines in particular. In terms of soils, vineyards around the Danube enjoy fertile, loamy soils, whilst glaciers and ancient seas have left areas of complex geology including clay rich in marine fossils and areas of chalk, sandstone, shale and limestone. Many areas are planted on steep slopes, sometimes terraced, allowing each vine full exposure to the sun. It is Austria’s speciality white wine grape, Grüner Veltliner (top, right), that has helped introduce many wine lovers to the country’s wines over recent years. A cross of Traminer and the near extinct St. Georgen, it is also Austria’s most widely planted variety, accounting for one third of country’s vineyard area. Riesling, Welschriesling, Weissburgunder (Pinot Blanc), Müller-Thurgau, Chardonnay and Sauvignon Blanc are planted in significant volumes, but the country has no fewer than 22 grapes classified for production of white wine. Most of the rest have less than 1% of the total vineyard area each, including some that are often bottled as single varietals, like Grauburgunder (Pinot Gris), Muskateller and Traminer. It is white wine that has always dominated in Austria, but a pair of local red wine grapes are now the focus for many producers and some specific regions, and there are wines being made of very high quality. Indeed red wine grapes now constitute one third of Austria’s vineyards, with 13 varieties classified for the production of quality wine. Blaufränkisch (bottom, right) is seen by many as a potential ace in the pack, capable of ageing and the speciality of the Carnuntum area that I visited on this trip. The related Zweigelt is another quality indigenous variety (the offspring of St. Laurent and Blaufränkisch) that is drunk eagerly by locals and increasingly overseas too, whilst plantings of St Laurent itself have been increasing. French varieties from Cabernet Sauvignon to Syrah are quite widely planted, but it is perhaps Pinot Noir (or ‘Blauburgunder’) that may have the greatest potential of all. With a total vineyard area of 46,000 hectares Austria is a significant producer, but then the Bordeaux region of France alone has more than double that. The great majority of Austria’s wine is dry, in both white and red, and the relatively small amount of rosé and sparkling wine that is produced. Although my visit and Austrian production focuses on dry styles, the ‘liquid gold’ of the country’s sweet wines is still very much in force: Auslese, Beerenauslese, Trockenbeerenauslese and Eiswein (ice wine) are categories familiar to drinkers of German sweet wine, but in Austria another Botrytis-based sweetness designation of ‘Ausbruch’ sits just below Trockenbeerenauslese, and ‘Strohwein’ is made from ripe grapes dried and allowed to shrivel on straw mats. Red wine production has doubled in just two decades. 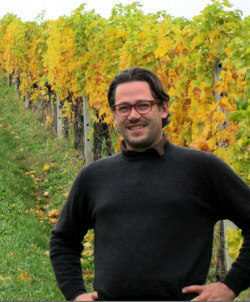 As described above, Austria has a renewed focus on expressing regionality and typicity in its wines. Districtus Austriae Controllatus is a relatively recent system that attempts to formalise this. Of Austria’s 16 wine growing regions, only eight have so far adopted DAC. In most cases a local committee has agreed a single grape variety that best expresses their region, and will produce DAC wines from that grape and bearing the name of the DAC region, for example ‘Weinviertel DAC’. Kremstal, Kamptal and Leithaberg have successfully lobbied to be allowed more than one grape to represent their region within the rules of DAC. And what of the eight regions who have not adopted DAC? Most have stuck with existing structures, whilst others are being gently encouraged to adopt DAC. But the whole picture does seem rather unclear when viewed from outside, with whole non-DAC regions, and even regions within the system producing both DAC and non-DAC wines simultaneously. DAC is equivalent to other European protected regions of origin and is meant to make it easy for consumers to recognise a broad wine style, but for the moment it is rather confusing. Perhaps that will change when most regions adopt DAC or the concept is better known. My all too brief visit to Eastern Austria took in two regions to the north, Weinviertel and Carnuntum, and two to the south, Burgenland and Styria. It was the briefest of visits to the wine region that is Austria’s largest, but which rarely falls under the spotlight. With over a quarter of Austria’s vineyards, Weinviertel is the volume powerhouse of the country, particularly for Grüner Veltliner, which is also the focus of the Weinviertel DAC. Around two-thirds of all plantings are Grüner. Stretching from the Danube to the Czech border, Weinviertel, meaning ‘wine quarter’, was historically producer of wines for local consumption, made on mixed agriculture farms where sugar beet or corn was a more important crop. Quality was variable and prices low, and in those fertile soils just about all and every style of wine was made. The past decade has seen not only the introduction of the Weinviertel DAC as a general quality move, but it has seen some of the small producers take wine a lot more seriously, sometimes abandoning the other parts of their farming business to concentrate solely on wine. Generally a region of rolling farmland, vineyards are still dotted around sporadically and it is rare to find large areas of contiguous vineyard. 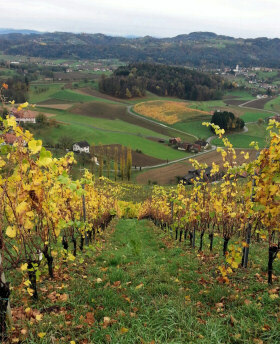 For the best producers, not only of Grüner Veltliner but of Pinot Noir, Riesling and Traminer too which are also favoured, exploring hillsides and soils away from the loamy-rich fertile plains is one key to quality, as are reducing yields and moving to organic farming or more sustainable use of chemicals. The charming but difficult to pronounce estate of Zuschmann-Schöffmann is one where the younger generation have moved a family farming business away from pigs, wheat and sugar beet, to concentrate on wine. Else Zuschmann’s parents still farm nearby, but as viticulturist she and winemaker husband Peter Schöffmann have been remodelling the business for 10 years, and are now one of very few organic farms in the region. They also offer comfortable and modern bed & breakfast accommodation and a ‘Heuriger’, an informal farm restaurant based around their home-grown wines and produce. “Agriculture alone is too difficult,” explains Else. “I believed our region is underdeveloped in terms of tourism and as Peter was a chef, having the heuriger was an easy choice.” Indeed Peter left life behind the stoves to study winemaking after he and Else met. “15 years ago Weinviertel had a poor image for wine – it was all about volume, not so much about quality,” he tells me “Growing grapes and making wine was such a small part of business that it wasn’t easy to persuade local farmers that high quality wines were possible.” Zuschmann-Schöffmann is one of the pioneering estates, and the couple agrees that the big differences are all in the vineyard: lowering yields, planting at higher density, and in their case, converting to organic farming. “We are in our first year of certification, and all of our new plantings are at 6,000 vines per hectare, the old way was maybe 3,000 – all based on the size of the tractors available.” Says Else. They are also reducing use of sulphur drastically “because the grapes are healthy,” and using techniques like battonage (stirring the lees) to make a different style of wine. Else and peter are huge fans of red wine, particularly Burgundy. They are one of very few local producers making red wines in Weinviertel – “It is rarely seen north of the Danube,” says Peter. One third of their output is red wine currently, but they would like to increase it a little, though Grüner Veltliner will remain their focus. Also part of Niederösterreich (or Lower Austria), Carnuntum draws tourists from nearby Vienna because of its rich archaeological history and Roman remains. But 910 hectares of its prime soils are now given over to wine, with a strong focus on red wines that benefit from the warming effect of the Pannonain plain. Blaufränkisch and particularly Zweigelt are the focus here, and this is one of the exceptions to the DAC system where a group of the highest quality growers has instead created the ‘Rubin Carnuntum’, a classification of Zweigelt wines. Wines appearing under the Rubin label follow a similar concept to that of DAC, with the single Zweigelt variety meant to define and focus the region. Interestingly the producers have decided that wines branded as Rubin are mid-price, mid-quality level and all producers have ranges above and below, as well as wines made from other varieties and blends. Carnuntum lies immediately south of the Danube where free-draining gravel over lime and loam soils is influenced not only by the Pannonian micro climate, but by their proximity to the river. Both combine to provide and trap warm air, making possible the full ripening of red wine grapes – including Bordeaux varieties like Cabernet Sauvignon, Merlot and Cabernet Franc. I did not visit individual estates here, but winemakers Johann Markowitsch of Weingut Lukas Markowitsch and Christina Netzl from Weingut Franz & Christine Netzl (right) took me on a tour of the region’s vineyards before we returned to a local hotel for a large range tasting of over 40 wines from more than a dozen estates. Stretching south and east of Vienna, Burgenland is subject to two important climatic influences. The first is its long border with Hungary and proximity to the Great Hungarian Plain. The largest part of the vast Pannonian basin, warm winds from the Great Hungarian Plain create conditions suitable for ripening red wine grapes, especially Blaufränkisch. The second great influence is further north: the Neusiedlersee, or Lake Neusiedl. The warmth and humidity created by the 121-square miles of this huge lake (and numerous, small, shallow lakes around it) encourages the development of Botrytis, the noble rot, making vineyards near here some of Austria’s best sweet wine vineyards, as well as allowing red wine grapes to ripen fully. Burgenland is arguably the red wine heartland of Austria. Burgenland is home to no fewer than four of Austria’s eight DACs (see above for a full explanation). 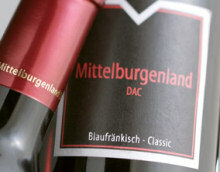 In 2005 Mittelburgenland DAC was established (specialising in Blaufränkisch), to be joined later by Leithaberg DAC (specialising in Pinot Blanc, Chardonnay, Neuburger and Grüner Veltliner for white wines, Blaufränkisch for reds), Eisenberg DAC (specialising in Blaufränkisch) and most recently in March 2012, Neusiedlersee DAC, specialising in Zweigelt. Burgenland is mostly fairly flat, though the foothills of the Leithaberg and Eisenberg Mountains are planted with vines that enjoy some altitude. Much is made of its complex soils too. A lot of it is rich and loamy, but clay and slate over lime can be found on the hillsides and there are pockets of more chalky soils suitable for white wines, as well as plenty of mineral content in the soils of the south. Burgenland has been a particularly active and high profile region for Austria, both for sweet wines and for the big Blaufränkisch push. Though Zweigelt is the most planted variety, it is Blaufränkisch that is seen by most as making the more serious wine, wines with the capacity to cellar, and wines with the potential for the greatest level of quality. I arrived for my appointment with Georg Prieler (right), winemaker at his family estate, just as the late autumn sun was beginning to set. We immediately jumped into his 4×4 and headed to a vantage point where we could survey his vineyards. He pointed out a vineyard of 80-year-old Pinot Blanc, and explained that here on the limestone and slate soils of the Leithaberg mountain foothills he farms organically, though not certified as such. 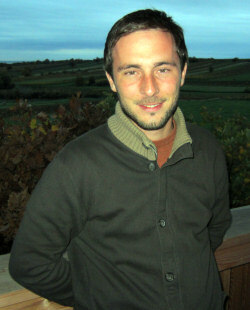 Georg is perhaps typical of the young generation now making such an impact in Burgenland and across Austria. 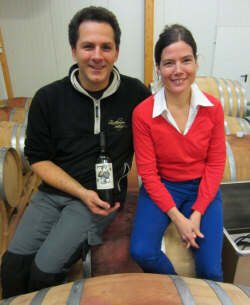 Whilst the parents often gained their experience working only on the family farm, after graduating Georg travelled to New Zealand to make wines with Austrian ex-pat Rudi Bauer at Quartz Reef in Central Otago, then on to Argentina to work at Norton, before a stint in California making Cabernet Sauvignon and working at the commercial end of the wine business for an importer in Berkley. Deep in the south-east corner of Austria, Styria seems to march to a slightly different beat to the other regions I visited on this trip. As a wine producing region and as a tourism hot spot it has only a very short history, certainly in the south of the region. “It was only a stopping point on motorway down to Italy or Slovenia,” according to Hannes Sabathi of the eponymous Weingut Hannes Sabathi. It was after the now infamous Austrian wine scandal of 1985/86 that this region became a new focus, with wine lovers turning to the few wineries in the region at that time, basically because Styria had not been involved. To show the rapid growth of wine here, the vineyard area has doubled in size over the past 25 years whilst many estates farm on a much more serious level. The development of restaurants and tourism has enjoyed a corresponding boom. Though Welschriesling is the most abundant variety of Styria (or Steiermark), it is – surprisingly perhaps – Sauvignon Blanc that has put the region on the map for many. Dubbed “Austria’s Tuscany”, it is an absolutely beautiful area of rolling hillsides and tiny villages, where vines climb steeply up breathtaking inclines. There is a freshness to the air here, and a freshness in the wines. The three sub-regions of South-eastern Styria (Süd-oststeiermark), Western Styria (Weststeiermark), and Southern Styria (Südsteiermark) each have their own specialities, but aromatic varieties are to the fore including Muskateller and Traminer for white wines, and Pinot Noir for red wines. Schilcher – a rosé wine made from the local Blauer Wildbacher grape is a speciality of Western Styria. 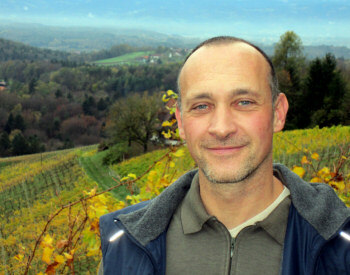 Hannes Harkamp (pictured) and his wife Petra look after this substantial estate in Southern Styria, whilst brother Heinz runs the family’s 26-room hotel which sits amidst the Flamberg vineyards above the town of Saint Nikolai Im Sausal. 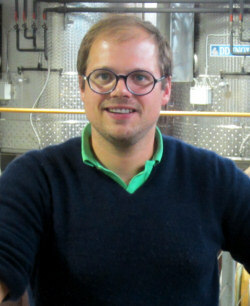 Sparkling wine is the speciality here, driven by Hannes’ passion for Champagne and other sparkling wines. Indeed, Harkamp is the only sparkling wine producer in Styria, and as well as their own range of wines, they make sparkling wines for more than 20 other estates. The Harkamps do produce the gamut of wine styles, including white, red and rosé still wines, and sweet wines too. Partly for sparkling base wine, they have the largest Pinot Noir vineyard in Styria and many of their vineyards are planted on vertigo-inducing 45º slopes. Hannes’ grandparents started producing wines here, but it is only for the past five years that the sparkling wine business has been developed by Hannes. The soils are limestone, though Hannes explains that the Flamberg vineyard, which rises to more than 400 meters, is the remains of the coral reef of an ancient sea that extended along the entire hill. Calcium deposits allow the grapes to ripen very well and give them a minerality. A whole variety of grapes is planted here including Riesling, Pinot Blanc and Pinot Gris, Muscat, Sauvignon Blanc and Chardonnay for white wines, and Zweigelt and Merlot as well as Pinot Noir for red wines. All of the wines from Weingut Harkamp are good, though it is fair to say that the range seemed a litte diffuse, perhaps just a touch variable. At their best, especially the Sauvignon and Pinot Gris from the top Kogelberg and Oberburgstall, they are superb. The Sekts are a work in progress but are of high quality. Perhaps the operation has just too many wines – plus the added complication of thier 20+ sparkling wine customers?